Back in November, my friends and I had a pre-Thanksgiving dinner. And by "pre-Thanksgiving" I mean basically an entire Thanksgiving dinner. It was a great time, but conisdering all the dishes that were made, there was a massive amount of preparation and then a ton of clean-up. I would love to do it again, but with a simpler meal. Could you help me come up with some ideas for meals that are simple, not too expensive and could feed anywhere from 7-12 people? This is such a good question, that I have turned it into a mini-series. Today's final installment: Comfort Foods. In recent editions, I took you through menu plans that would use a minimum of dishes. This one may require a bit more clean-up, but the recipes are all simple and delicious - and they're easy to double, triple, or quadruple to feed a crowd. Here we go! Prep time: 15 minutes. Cook time: 25-30 minutes. What you'll need: A cutting board and a sharp knife; a can opener; oven-safe baking dish; something to stir with; your clenched fist pounding the crackers to smithereens OR a food processor; a lemon juicer OR your bare hands juicing a lemon. This dip has been a family tradition at our house since, oh, the 1940's, when somebody read the recipe on the back of a Ritz crackers box, and made a few Italian suggestions. The consistency is more like bread pudding than what you're probably thinking of. It is deeply satisfying, and a snap to make. Prep time: 15 minutes. Cook time: 15 minutes. What you'll need: A cutting board and a sharp knife; garlic press; can opener; wooden spoon, cheese grater. You'll be chopping vegetables, opening cans, and grating some cheese while you let things simmer. It's a simple recipe and a great way to fill people up if you've got some big eaters coming. You can always make this in bulk and freeze what you don't end up eating. What you'll need: A cutting board and a sharp knife; pasta pot, collander. This pasta dish is more elegant than opening up a jar of sauce, but almost as simple! Your guests will love it. Don't feel like springing for expensive parmesan? Grated mozzarella makes a great substitution. Prep time: about 30 minutes to make the apple tartlet filling; another 30 minutes to bake the tartlets. You can use those same 30 minutes to let the cider steep and mix up some cinnamon butter. 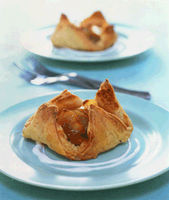 The filling will take a little bit of effort, but assembling the tarts could not be easier. They will look bangin' coming out of the oven, and the hot buttered rum cider will knock people out! If You Liked Anchorman . . .
Katie & Rob: Wedding Feast!